June of 1974 got off to a BIG start in the Mid-Atlantic area, with Andre The Giant making a weeklong swing through the territory during the early stages of the month. Andre participated in conventional tag team matches, handicap matches and his signature matches, Battle Royals. Andre’s handler Frank Valois accompanied him to the arenas, and Frank wrestled preliminary matches on the cards where Andre appeared. Surprisingly, Andre did not win the two Battle Royals that he participated in during June. However, the seven foot four Giant was the star attraction in both Battle Royals, and had to deal with a large number of wrestlers joining forces for the sole purposes of eliminating Andre! That tactic was effective, as in Greensboro, North Carolina on June 6th Bob Bruggers was the last man standing, and the next night at the Richmond Coliseum in Richmond, Virginia, Tiger Conway, Jr. came away with the victory in that hotly contested Battle Royal. The “Eighth Wonder Of The World” also wrestled in several Handicap Matches during the month, and the Giant certainly faced off with some interesting teams that were created for that purpose. On June 4th at the Dorton Arena in Raleigh, North Carolina, Andre disposed of the crafty team of Mike Paidousis and “Bruiser” Bill White. 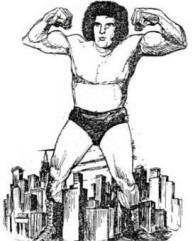 In June, Andre also wrestled Handicap Matches against Chuck O’Connor and Mike Paidousis in Roanoke, Virginia on June 8th, and then the next night the Giant battled the interesting duo of Chuck O’Connor and George “Two Ton” Harris in Rocky Mount, North Carolina. The Japanese tandem of Mr. Hayashi and Mr. Ota were the unfortunate souls who had to wrestle Andre in conventional tag team matches. In Anderson, South Carolina on June 5th, the Japanese duo was demolished by Andre and partner Sandy Scott. Hayashi and Ota did not fare any better when they faced the Giant and Nelson Royal on June 10th in Charlotte, North Carolina. Also during the early days of the month of June, Indian Chief Wahoo McDaniel made his initial appearance on Mid-Atlantic Championship Wrestling television. A particularly impressive performance over the always tough Gene Lewis had Mid-Atlantic fans hungering to see more of Wahoo. McDaniel looked like one of the toughest “good guys” Jim Crockett Promotions had seen in a long time! Mid-Atlantic Television Champion Ivan Koloff managed to maintain a hold on his Title during the month, but he was repeatedly pushed to the limit by Paul Jones. These two had an amazing run of FOUR matches against each other during the month of June in Roanoke, Virginia! Koloff and Jones faced off at the Starland Arena in Roanoke on June 1st, and the wild melee ended up in a Disqualification result. Because of that decision, the two came back to Roanoke on June 8th, this time for an outdoor show at Victory Stadium, in a No Disqualification Match. This bout was ruled a No Contest, as it appeared that Koloff hit Jones with some kind of foreign object. Because of Koloff’s antics, the Return Match on June 15th had quite an unusual stipulation! Koloff and Jones came back to Victory Stadium in Roanoke on June 15th, with Nelson Royal and Sandy Scott charged with the obligation of searching both men before their bout! Of course, this stipulation was aimed at Koloff, who had been suspected of bringing foreign objects into the ring in their recent Roanoke bouts. Koloff gave both Royal and Scott all kinds of problems when they tried to search him prior to the June 15th bout, and that back and forth was nearly as entertaining as the actual bout. The final bout between Koloff and Jones in Roanoke during June was also held at Victory Stadium, and was Ivan’s specialty match, the Russian Chain Match. This June 29th bout was exceptionally brutal, with both men losing huge amounts of blood. This match typified the vicious nature of the matches between Koloff and Jones during June of 1974. Mid-Atlantic Heavyweight Champion Johnny Valentine wrestled in more tag team bouts than normal during the month of June, and the month saw his major singles challenge come from the sensational newcomer from Houston, Texas, Sonny King. Sonny had a lot of incentive against Valentine, as Johnny was the wrestler that paid the bounty that crippled King’s brother, Bearcat Wright. King started off the month in fine fashion, defeating Johnny “The Champ” cleanly in the middle of the ring on June 7th at County Hall in Charleston, South Carolina. The two went at it again in South Carolina on June 17th, when the Greenville Memorial Auditorium hosted an exciting bout between the two. In this encounter, King became so enraged with Valentine that Johnny won a controversial victory by disqualification. As June drew towards its end, King and Valentine took their grudge battles up into Virginia. The two had a bitter battle at the Hampton Coliseum on June 22nd, with King’s speed giving Valentine all sorts of problems. And then on June 28th under the lights at Parker Field in Richmond, King gave the fans on this superb summer evening a real treat as he pinned Valentine for the elusive three count! Unfortunately, the bout was not a Title Match for Valentine’s coveted Mid-Atlantic Heavyweight Title. Mid-Atlantic Tag Team Champions Paul Jones and Bob Bruggers did not have an active month of Title defenses during June. A large reason for this was all the time and energy that Paul Jones was expending in his program with Ivan Koloff. However, Jones and Bruggers did have a couple of noteworthy defenses during the month. On June 13th in Winston-Salem, North Carolina, the Champions defeated the devious duo of Rip Hawk and Johnny Valentine. Jones and Bruggers posted this victory in front of 3,100 enthusiastic fans in 23 minutes, via disqualification. In Raleigh, on June 25th, Jones and Bruggers also retained their belts against the fearsome combination of Ivan Koloff and the Super Destroyer. Speaking of the Destroyer, the mega feud between the Super D. and Swede Hanson finally slowed down significantly in June. In fact, the two behemoths only wrestled a handful of times in singles matches during the month. The only Mid-Atlantic town that saw multiple bouts between the two in June was Charlotte, North Carolina. On June 3rd, the two arch enemies battled in a spirited Strap Match, which led to the Super D. and Big Swede coming back to Charlotte on June 10th in a Lumberjack Match. This bout was one of the wildest of the year, with all 10 Lumberjacks going haywire and the match ended up being declared a No Contest! The wrestler who wrestled the Super Destroyer the most in June in singles competition was Tiger Conway, Jr. A wild bout between the Super D. and Conway occurred on June 29th in Spartanburg, South Carolina. This was a Lumberjack Match, and the lumberjacks were nearly as out of control as the wrestlers! Tiger was awarded the victory on a reversed decision, much to the delight of his thousands of fans in attendance. Tiger Conway also set a significant mark several days prior to his victory over the Super Destroyer in Spartanburg. On June 25th in Columbia, South Carolina, Tiger beat the tough veteran Bill White in a lightening fast 17 seconds, a Township Auditorium record! Conway truly became a major force in Mid-Atlantic Championship Wrestling during June of 1974. A team that was also becoming a major force in the territory in June was the tag team of Rip Hawk and Ric Flair. As the month wore on, Flair and Hawk seemed more comfortable as a team, and the results showed that. Roanoke, Virginia saw the Flair/Hawk team in three consecutive weeks, and each week this duo looked stronger and stronger. On June 15th in Roanoke, Ric and Rip defeated the popular duo of Nelson Royal and Sandy Scott via disqualification. The two teams had a rematch on June 22nd, and the “bad guys” controlled the action even more thoroughly. Finally, Roanoke saw the Flair/Hawk combination dominate the tandem of Bob Bruggers and Danny Miller on June 29th. Ric Flair and Rip Hawk were heading straight to the top it appeared. Action was hot and heavy in the Mid-Atlantic area during the month of June. Particularly, the feud between Ivan Koloff and Paul Jones was becoming nearly as torrid as the program with the Super Destroyer and Swede Hanson was at its apex. And with new stars Tiger Conway, Jr. and Ric Flair feeling their oats, July looked to be every bit as exciting as June was! 1. Sonny King---The younger brother of Bearcat Wright was red hot during the month of June, giving Mid-Atlantic Heavyweight Champion Johnny Valentine all he could handle. King had a lot of incentive, as Valentine had put the bounty out on his brother, Bearcat Wright. 2. Tiger Conway, Jr.---Tiger put together an impressive series of victories in June, concentrating primarily on singles matches. The young Texan was rising rapidly through the ranks as the month progressed. 3. Ric Flair---Ric also had an extremely impressive month during June. His tag team with Rip Hawk really took off in June, and this duo looked to be the real deal! 1. 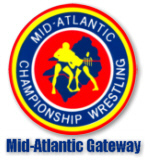 Danny Miller---The first Mid-Atlantic Television Champion fell out of main event matches for the most part during the month. Danny still functioned well as a tag team wrestler, forming solid teams with Nelson Royal and Sandy Scott on occasion. 2. Chuck O’Connor---The mammoth O’Connor appeared to be less and less imposing as the month of June wore on. While his sheer size allowed Chuck to dominate at times, the wrestlers in the territory appeared to be figuring out other aspects of his game. 3. Swede Hanson---Make no mistake, the Big Swede was still a handful for anybody, but the brutal feud with the Super Destroyer seemed to have taken a lot out of the big man from Newark, New Jersey. Time would tell if the Swede could rebound.